A stream once desecrated and with a lack of native fish life has made a drastic recovery due to one man and his family. Mangati stream located south-west of Pukekohe has been on the backyard of the Muir family farm for more than five generations. A stream which flows from the Waikato River was once thriving and flourishing in an abundance of native fish and bird life. Due to the degradation of the Waikato River over the flow of time, the Mangati stream suffered, causing a certain native fish species to vanish from the area, our beloved Inanga/Whitebait. 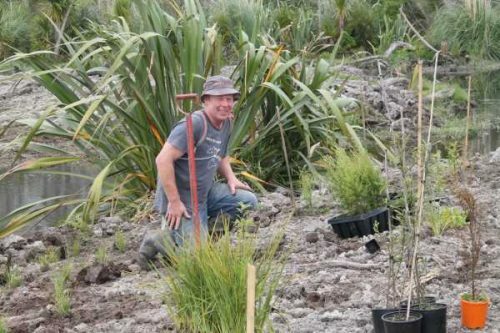 Farm owner Stu Muir had a goal to increase Inanga flowing back into the Mangati stream by undertaking environmental restoration works to create Inanga habitat. 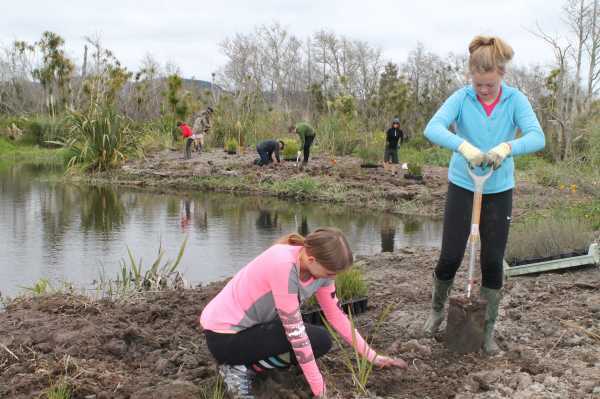 Since 2011 the Waikato River Authority has helped fund the Mangati Stream Inanga restoration project. Since then Stu Muir along with his family and over thousands of volunteers have planted over 60,000 native plants, eradicated thousands of animal pest and maintained over 20 hectares of pest plant control. At the start of the project the Mangati was a stagnate stream because the mouth of the tributary had been blocked due to pest plants including pampas and willow. Earth works had be done to remove the pest plants which allowed water to flow to create a current. The now flowing current in combination with riparian restoration and animal pest control has seen the revitalisation of Inanaga with-in the Mangati stream. As an added bonus the riparian planting has created a food source for birds. Stu has since seen the return of native birds such as Kereru and Tui with-in the area. A pair of highly rare Australasian Bitterns had been seen to visit the stream often and Stu is hoping with the continued success of the project more pairs will continue to come. Stu says that this project has helped to bring a lot of people together with-in and outside of the community engaging thousands of volunteers over the years. A large range of groups have been involved with this project through hundreds of workshops that Stu has hosted. These groups range from schools, iwi, local authorities, commercial businesses and surrounding land owners. “The project has had a flow on effect where adjacent farm owners have started doing their own restoration works as well” Stu says. Juggling the family farm business, managing the Inanga project and spending quality time with his family can be challenging at times but Stu says he wouldn’t have it any other way. “It’s my responsibility to be Kaitiaki (guardian) of this land so that’s what I’m going to do”. Because of the hard work and dedication Stu has put into this project he has been nominated for multiple environmental awards such as a NZI Business Sustainability Award, a NZ Biosecurity Award, New Zealander of the Year and featured on TV shows such as Country Calendar. The Mangati Stream is a great template and example of good old fashioned hard work when it comes to environmental restoration. It is a great natural resource where all can learn and benefit from. Future goals for the project is to continue to grow and build on the restoration works, build a boardwalk and bridge so the stream is more accessible for others to continue to enjoy and learn from.